In writing The Canadian Century, Brian Crowley, Jason Clemens, and Niels Veldhuis have done a great service for Canada. It isn’t just that they have reminded Canadians of the remarkable vision and record of one of our greatest prime ministers, Sir Wilfrid Laurier, and shown how his plan for Canada is as relevant and vital to us today as it was in his day. It isn’t just that they tell more comprehensively and more clearly than anyone before them the story of a reforming generation of Canadian politicians. Nor is it just that they paint as detailed and sobering a picture as anyone on either side of the border ever has of the tax, debt, and spending trap which is daily ensnaring our American friends and allies. 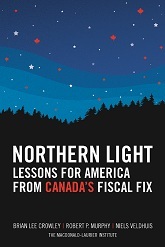 What they have done is to go beyond each of these individual stories, weaving them together into a single comprehensive look at the opportunities that await Canada in the twenty-first century. In so doing they reveal something of the genius of Canada. We are neither a boastful nor a prideful people, but we think that we ought to do the right thing, even if it takes us a little while to figure out what that might be. And when we get the bit between our teeth, we see things through.